Former Republican presidential hopeful Carly Fiorina says she is endorsing Texas Sen. Ted Cruz for president. 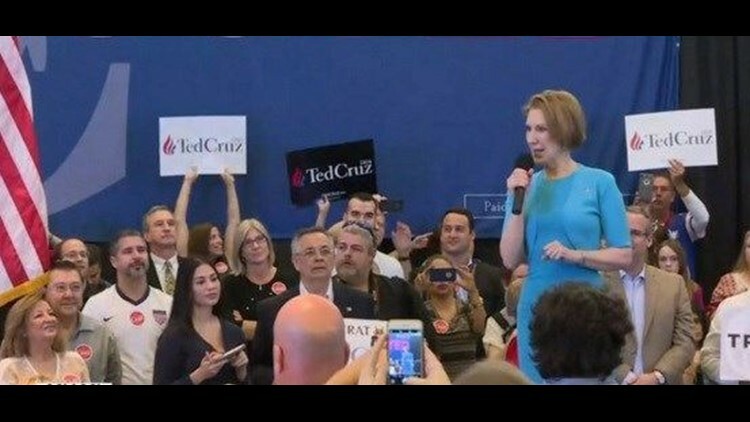 Speaking at a rally in Miami Wednesday, Fiorina called Cruz a "leader and reformer... willing to take on the status quo in Washington." She roused a chorus of boos from the crowd when she mentioned front-runner Donald Trump and referred to the billionaire businessman and Democratic front-runner Hillary Clinton as "the system." Donald Trump won most of the delegates in Tuesday's contests but he still must do better to win the nomination before the Republican National Convention this summer. Trump won three out of the four states that voted Tuesday. But Trump's lead over Ted Cruz in the race for delegates grew by only 15 delegates. That's because all four states awarded delegates proportionally, so even the second-place finisher got some. Trump has won most of the states that have voted so far, but he is winning only 44 percent of the delegates. Cruz is doing worse, winning only 34 percent. It takes a majority of the delegates to win the nomination. The delegate math highlights the importance of primaries in states like Ohio and Florida, which allocate all of their delegates to the winner. The two delegate-rich states vote next Tuesday. In the overall race for delegates, Trump has 458 and Cruz has 359. Marco Rubio has 151 delegates and John Kasich has 54. Republican presidential candidate John Kasich is repeating his prediction that he'll win his home state of Ohio next week and predicts that "will be a whole new ball game" in the campaign sweepstakes. Kasich says he did better in Michigan — finishing in third place closely behind Ted Cruz — than people expected he would do just weeks ago. He tells ABC's "Good Morning America" in an interview that now "we are beginning to be heard and we are gaining." He declares "we are still standing," even though the Ohio governor hasn't yet won a primary or caucus this season. He adds that "the calendar has moved more to home-court advantage" and says that he's "really not that far behind" front-runner Donald Trump in overall support heading into next week. Republican presidential candidate Donald Trump says there's a need for the party to unite around him, but argues that it isn't yet time for him to dial back his aggressive campaign style. Celebrating victories Tuesday night in Michigan, Mississippi and Hawaii, the billionaire real estate declared Wednesday that "I am a uniter." But he also says he was the victim of "vicious" campaign ads on behalf of his rivals last week and that "I didn't set the tone of negativity" in the race. Trump says he merely "fought back" and says he has to still run hard. He tells CNN's "New Day" show Wednesday that "I have to finish off the project." Trump adds that he expects Thursday night's GOP debate in Florida to be "a nicer, softer, lighter" event in the wake of his latest triumphs. Trump also revealed that he's had a "very conciliatory" conversation with House Speaker Paul Ryan.